This post was supposed to review multiple E.l.f. products, but I’ve decided to devote it entirely to E.l.f.’s new line of clay eyeshadow palettes. I am so torn on this product–if I’d combined this review with other products this post would be ridiculously long. So I’ll get to the Studio Blush and Undereye Setting Powder soon, but today, let’s talk about the clay eyeshadow palettes. So here’s my second update for my E.l.f. haul! These palettes each contain 5 eyeshadows, and E.l.f. offers 4 different palettes. They are $6 a piece. I tried the palette in Seaside Sweetie. This palette was sent to me as a gift with purchase for a recent E.l.f. order, so I did not choose this particular shade selection. 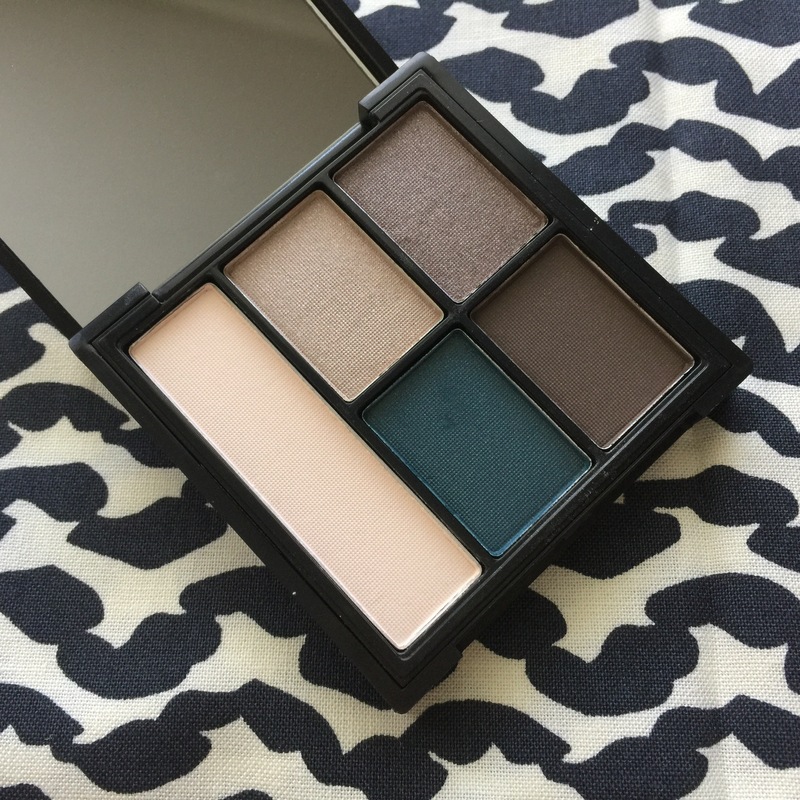 It is beautiful to look at, though–I love a teal eyeshadow, and this one is stunning. Otherwise, though, it is a distinctly cool-toned palette–all the shades have cool gray undertones–and I typically use warm shadows. I liked the look of it so much, though, that I was determined to make it work. Overall, the shades are very pigmented. The teal is especially good–it swatches nicely and the color payoff is outstanding. They are a little stiff to work with, but I’ve found this is typical of clay eyeshadows I’ve used the in the past. The Tarte Tartlette Amazonian Clay Eyeshadow Palette, for example, is a bit stiffer than my Lorac eyeshadows. The problem I have with this palette, though, is that it is not super easy to work with in terms of blending. The shimmery gray shade (upper right corner) had a ton of fallout and I really had to build it to get it to show up on my lid. Same for the pale gray shade in the upper left corner–it barely showed up so I had to pull in another shadow for a crease shade. 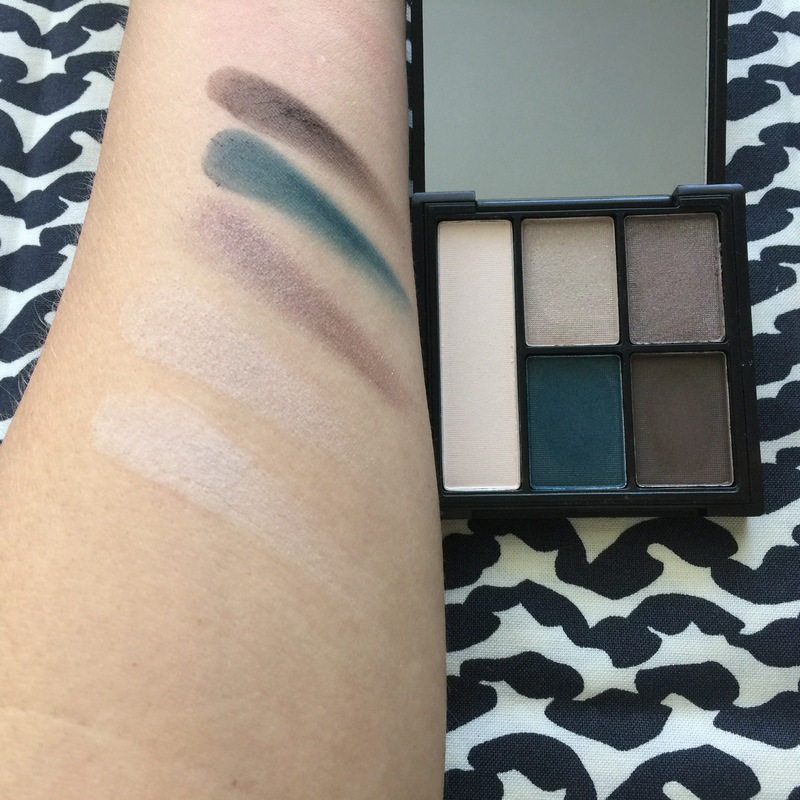 The teal eyeshadow, on the other hand, practically stains your lid almost immediately, making the color payoff and staying power good, but it also makes it difficult to blend with the other shadows. If you use a very precise pencil brush to place it at the outer corner or under the lower lashline and don’t need to move it around, you’ll probably be fine. You can blend out the edges a bit. But if you’re not super precise, any resulting eye look will be muddy. Because the rest of the shadows have gray undertones, when I tied to blend them together, I ended up looking bruised. Seriously. My colleagues kept walking by my office all day and pausing, saying “There’s something different about you today. Did you straighten your hair?” They couldn’t put a finger on what looked off, but I knew it was the eyeshadow. On a side note, I’m want to say that I’m okay with that. I’m proud of myself for trying something that maybe didn’t work as I’d hoped. Part of what I love about makeup is that it makes me take some risks and reminds me that it’s okay to fail, that it’s not the end of the world. It is the perfect antidote to my sometimes-paralyzing perfectionism. That said, I’m unlikely to keep using this particular palette on its own. I did like the look of the teal shadow in the outer corner IF I used a warm bronzer or brown shadow in the crease, rather than the cooler shades in the palette. And it is great for under the lower lashline–it won’t budge. I may use the cool taupe shades as well–I do like experimenting with cooler shadows. But I just don’t like the combination of teal and taupe on my warm skin. If you have fair skin with cool undertones, this may work well for you. And E.l.f. has several other palettes in this line that are more neutral, so if you want to try them out, I’d recommend purchasing Saturday Sunsets (the warmest palette in the line) or Necessary Nudes. Final Word: Honestly, E.l.f. has so many good eyeshadow palettes that I will most likely stick to their 10-pan shadows like the Rose Gold palette or their Mad For Matte palette. If you want good shimmer shades, I hear their Prism palettes are amazing, though I haven’t tried them myself. I think these clay palettes are fine, but I probably won’t seek out another since E.l.f has so many other good products to choose from.